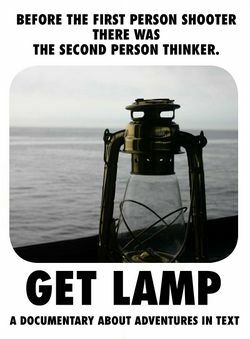 Get Lamp: The Text Adventure Documentary (http://www.getlamp.com/) is a documentary film project by Jason Scott, Filmed between 2006-2008 and released in 2010. Filming started in February of 2006 with an interview of Mike Berlyn, with pre-production research taking place at least a year before that. (cast) = Link to the interviewee's cast page on the Get Lamp website. (clips) = Link to raw interview footage available at the Internet Archive. The GET LAMP Interview Archives. Video interviews of most of those people interviewed for the GET LAMP documentary, including many unused segments. Get Lamp and Watch by Nick Montfort. This page was last modified on 27 February 2018, at 19:12.